Ben Whittaker (Robert De Niro) is a 70 year old widower who wants more from his retirement than well, just retirement. As a result, Whittaker decides to apply to become a ‘senior’ intern at a trendy online fashion website. Assigned to help the company’s increasingly frazzled founder, Jules Ostin (Anne Hathaway), Whittaker initially feels out of his depth. However, the more he observes the business, the more he realises that his experience is still relevant and that he still has something important to contribute. I’ll admit that I didn't have particularly high hopes for The Intern. It felt like a story I had seen before (probably also starring Anne Hathaway) and Robert De Niro is far from a safe bet these days. I was, however, pleasantly surprised by this latest film from Nancy Meyers (writer/director of It’s Complicated). 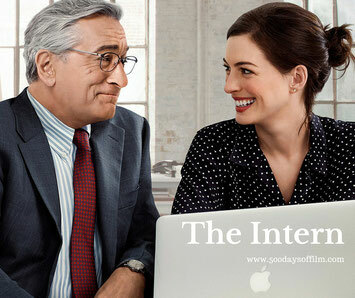 The Intern is a fun and engaging movie that dares to cross the generational divide. A lesser movie might have featured a younger male intern who both helps his boss and also becomes a worthy love interest (wait… I think I’ve watched that one don’t you?). Of course, both Hathaway and De Niro could play these roles with their eyes closed. However, to their credit, neither sleepwalk through this film. Indeed, each give entertaining and rather moving performances. Meanwhile, the rest of the cast are likeable and fun (it is, of course, always a pleasure to see Rene Russo) and the film is loaded with lighthearted gags - mainly at the expense of Whittaker's age and old school business ethos. While The Intern does not seek to be more than it is - a warm-hearted comedy - the film does touch on more serious themes of widowhood, retirement, working mother’s guilt and the ability to ‘have it all’. To her credit, Meyers does not tie up these themes in a neat little bow. In many ways Ostin and Whittaker have the same problems at the end of the film as they had at the start. However, they now have each other, As a result, The Intern leaves us with an undeniably positive sense of hope. I watched The Intern as part of my women in film season. For three weeks, I have challenged myself to only watch films with female directors. Hardly a challenge you might argue - and, based on my experience so far, I would be inclined to agree! Have you seen The Intern? If you have, what did you think about this film? Do let me know by leaving me a comment in the box below.